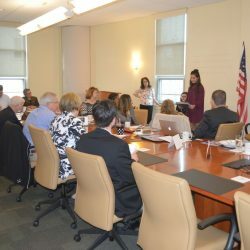 Members of the Youth Advisory Committee present their funding recommendations to the board of Berks County Community Foundation in the spring of 2018. READING, PA – Three programs that aim to improve mental health among youth in Berks County are being awarded a total of $15,000 in grants from the Youth and Philanthropy Fund of Berks County Community Foundation. The 30 teen members of the Community Foundation’s Youth Advisory Committee (YAC) spent the 2017-2018 school year learning about philanthropy, discussing issues that face local youth, evaluating organizations that tackle those issues, and deciding which of those groups will receive grants. YAC members identified mental health issues as a major concern for students in Berks County. $8,000 to the GoggleWorks Center for the Arts, Reading, to conduct art workshops for students identified by social workers as having mental health issues. The program – called ArtsBridge: Enhancing Well-Being Through Creativity – will enhance well-being by reducing anxiety and other forms of emotional stress for Berks County youth through high-quality workshops in state-of-the-art studios.$4,000 to Best Buddies Pennsylvania, based in King of Prussia, to operate the Best Buddies Middle School Friendship program, which operates in some schools in Berks County. The program builds one-to-one friendships between students with intellectual and developmental disabilities and those studying the standard curriculum. The program offers social mentoring while improving the quality of life and level of inclusion for a population that is often isolated and excluded. Best Buddies requires that new friends contact each other once per week and that they spend time together at least twice per month for a minimum of one year.$3,000 to Abilities in Motion, Reading, to run STARS (Students Transitioning to Achieve Realistic Success), a summer work-readiness program that serves 30 youth with autism spectrum disorder and other disabilities.